How are prison guards affected by overseeing prisoners on death row or even participating in executions? What effects does it have in the short and the longer term? 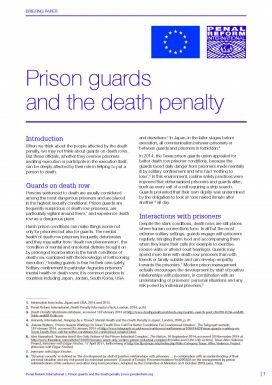 This short paper draws on research and interviews with prison guards to outline the psychological impact that guards who have worked with prisoners for many years on death row can experience when a prisoner is put to death. This paper is part of a series looking at the wider impact of the death penalty. See also our paper: Fighting for clients’ lives: the impact of the death penalty on defence lawyers. This briefing paper, written by Susannah Sheffer, draws on her book Fighting for their lives, demonstrates the profound and long-lasting impacts that the death penalty can have on those indirectly affected by it.